Expert lockout programs and compliance management to protect your employees. Lockout Tagout is an important safety procedure that involves isolating the energy source during maintenance or repair. The procedure protects employees from risks caused by power sources. Used properly in conjunction with a well-planned lockout process, the safety padlock helps ensure that employees will not inadvertently energize a piece of equipment while someone else is working on it. Thousands of accidents occur while repairing or servicing equipment. Most of those accidents are due to energy sources that have not been isolated. Therefore, identification of the equipment's potential hazard is essential for a successful safety prevention procedure. All employers have a duty of care to provide their employees and contractors with a safe working environment. 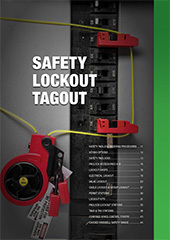 Where there is moving machinery and plant items in operation an effective Lockout/Tagout program is a vital component. Download the Master Lock Safety Solutions Product Catalog Today!